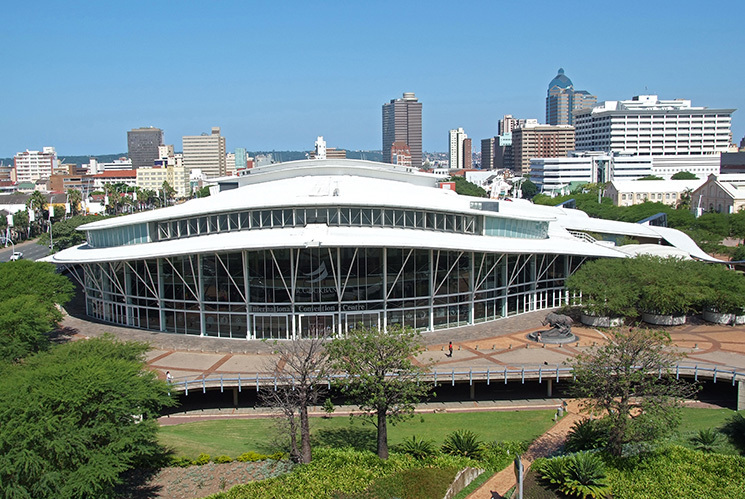 Today, a conference venue of the stature of the Durban ICC is judged on more than its ability to meet the complexities of global conference needs. There are other less visible, but no less valuable, criteria on which global players base decisions as to where to host their significant events. Increasingly, the world is insisting that award-winning venues, such as the Durban ICC, walk the talk of sustainable architecture, environmentally responsible design, and on-going green initiatives. From the outset, the Durban ICC’s commitment to environmental responsibility and compliance with international standards has been steadfast. The advanced design of the complex through all its phases integrated cutting-edge technologies, and utilised skills and materials which promoted a greener, ultra-sustainable environment, both inside and out. Whilst this commitment is a way of life at the Durban ICC which influences every aspect of the way the Centre is run, it is best demonstrated by the maintenance of the ISO 14001 certification which the company achieved and has maintained since 2011. This stringent global rating verifies that the Centre is minimising its harmful effects on the environment and works continually to improve its environmental performance. The world-class, high-tech design of the Durban ICC building itself incorporates green elements such as large glass facades for natural lighting, reducing the need for artificial lighting, and energy saving escalators which only activate when stepped on. In addition, the Centre utilises energy-efficient air-conditioning systems which build up ice overnight, which is used to cool the building the following day. Indigenous landscaping is a feature of the Durban ICC, with the majority of plants local to KwaZulu-Natal, limiting the reliance on irrigation. The Durban ICC’s water use profile is low for a building of its size. The installation of sensor taps in the bathrooms prevents water waste and even its toilets have been converted to a more efficient water usage system. The Durban ICC’s culinary department grows its own culinary herbs for use in its kitchen, which serves the majority of catering needs at the Centre. Other environmentally responsible measures which the Centre has implemented include the use of bio-degradable cutlery and food containers whenever possible and the move away from using tablecloths in its conference offering. The Durban ICC focuses on minimising waste at source. Key interventions have included reducing the supply of bottled water for events and functions, favouring tap water filled jugs and water dispensers. This is made possible by the excellent quality for Durban’s tap water, which is completely safe and tasty to drink. The Durban ICC has also implemented a stringent waste separation policy which aims to achieve the maximum possible volume of waste being sent for recycling. The last assessment indicated that more than 40% of the waste generated at the complex was recycled. The Durban ICC and DEC buildings have recently undergone an energy efficiency retrofit, which includes the latest in lighting technology. This retrofit is anticipated to reduce the energy requirements of the complex by approximately 7% of the current total demand. Through a recent partnership project between the eThekwini Municipality, Philips Lighting Southern Africa, and Eskom, one hundred and fifty five (155) street lights in the Durban ICC precinct have been retrofitted with energy efficient Iridium LED street lights. In addition, four of the major road intersections around the Durban ICC have been fitted with solar traffic lighting. The total energy savings from these interventions is expected to be in the order of 68.6 MWh per annum. The three Baobab trees in the gardens at the front entrance of the Durban ICC are indigenous to South Africa but are not locally indigenous to Durban. These were planted as feature trees and were brought in from Louis Trichardt in the Northern Province during the construction of the building, and now represent some of the most southern living Baobabs in Africa. The coffee bar on the mezzanine terrace of the Durban ICC is named the Baobab Cafe after these trees which symbolize the strength that lies in the different cultural groups in the province. Adjacent to the main entrance of the Durban ICC stands a life-size bronze statue of a White Rhino (Ceratotherium simum). The White Rhino is an icon of conservation, as the species is one of a few in world which has been saved from extinction. The main threat to this species has been, and still is, poaching and killing of these animals for their horns, which are used in traditional remedies in parts of Africa and Asia. It was primarily through the dedicated work of the KwaZulu-Natal Parks Board (now called Ezemvelo KZN Wildlife) and its affiliated KZN Conservation Trust, that this species was shifted back from the brink of extinction in the 1980’s and ‘90’s. This incredible achievement raised the hopes and spurred on the work of other conservation bodies towards saving other species of South Africa’s wildlife facing similar threats. These successful conservation efforts have established one of the greatest wildlife industries the world has ever seen and has firmly established South Africa’s global reputation as a world leader in biodiversity conservation. This achievement was also the reason why the International Union for the Conservation of Nature (IUCN) held the 5th World Parks Congress at the Durban ICC in 2003. The choice of Durban as a venue was a tribute to both the conservation success in the province and in South Africa. The white rhino is the living symbol of that success. The KZN Conservation Trust, an independent fund-raising organization tasked with supporting conservation through raising funds from the private sector, undertook to raise the funds to have the statue cast in bronze so that it could be a permanent tribute from the people of South Africa to the success of the country’s proud conservation record. Funds were raised through public subscription and renowned sculptor Dylan Lewis created the life-size statue. On March 15, 2003 the rhino set out on its journey from the foundry in Stellenbosch to Durban for a two-day trip, passing through the towns of Paarl, Worcester, Beaufort West, Colesberg, Bloemfontein and Bethlehem before joining the N3 on its final leg to the Durban ICC. It arrived in Durban on March 17, to a special welcoming ceremony.